The Linksys app is a free application which allows you to configure your Linksys Smart Wi-Fi routers and Velop system settings locally or remotely over the Internet. You can also associate multiple devices with a single Linksys cloud account. If you have separate networks at home and in your workplace and you want to manage both from wherever you are, you can switch between devices to modify settings using your Linksys cloud account. This article will provide you instructions on how to manage multiple devices using the Linksys app. IMPORTANT: Before you proceed, you need to install the Linksys app on your device. For Android™ devices, click here. For iOS devices, click here. On your mobile device, tap the Linksys app icon and access the Dashboard. To access this using a Linksys Smart Wi-Fi Router, click here. If you are using the Linksys Velop, click here. Tap the router or Velop icon on the Menu section. 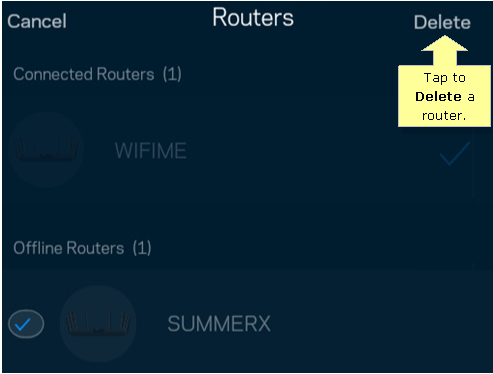 If more than one (1) router is associated to your account, you can tap the arrow to show the routers associated to the Linksys cloud account. If only one (1) device is associated with the Linksys cloud account, this area will not be tappable. A list of associated routers or nodes with your Linksys cloud account will be displayed. The device where the network is connected will show a checkmark. 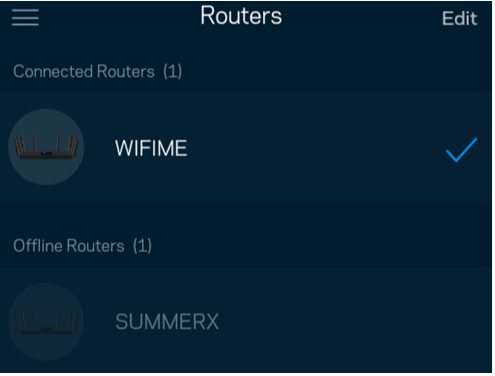 Tap another router or node icon under the Connected section if you want to switch to another device. Any offline devices will appear under the Offline section. NOTE: Some details on the images shown below may vary depending on the Linksys device you are using. The Edit option allows you to select an offline router or node and remove it from your Linksys cloud account. You can tap Delete if you no longer own the router or node. Alternatively, you may need to associate the router or node to a different Linksys cloud account.